Just a few of our favorite upcycled projects, featuring pieces by Brooklyn Bird Designs, Little Bear Bots, Honeysuckle Handmades, Little Clouds and Rainbows, Lauren Smith Janzen, Three Little Muses, and LoveyDoodle Designs. We learned early on that the gMums and gDads in our community were not only a passionate bunch, but incredibly talented as well. So it came as no surprise that we began to see our g take on new applications at the hands of gMums. At first, though we were ecstatic to see passion fused with creativity in the name of g, it was a bit of a head-scratcher. How does a company retain its branding and also support the fans who have infused the brand with their own whimsy and talent? For a tiny company trying to leave its mark, this was a problem of the prettiest kind. We looked for examples from other brands but couldn’t find any who faced a similar puzzler so we worked together with our gMums to create an upcycling program, a way to officially authorize and support gMums’ creative modifications to the product. There’s something special in that little g, and gMums and Dads have embraced it as their own, making it more than a logo. They’ve upcycled gPants into new clothes, toys, accessories, gifts and goodies. They’ve created businesses from upcycling! They’ve turned their g creations into fundraising initiatives for Every Mother Counts and to support other parents in their communities. 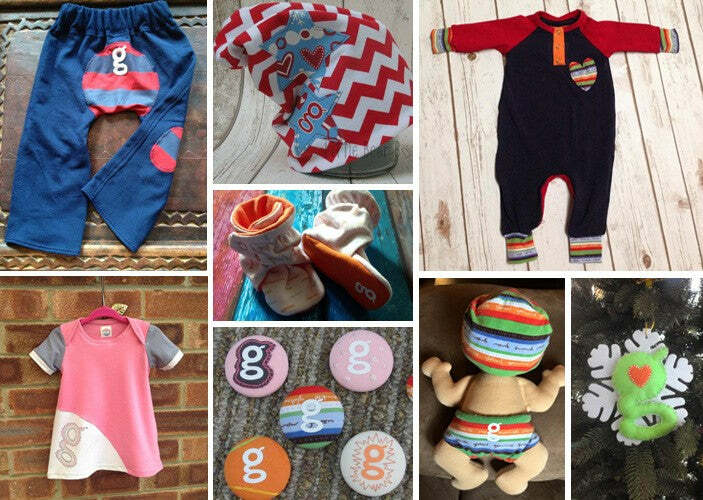 It began with a logo and an innovative nappy, but it’s the passion and creativity of our community that keeps g growing. Thank you, gMums and gDads (and gGrandparents!). Thank you for letting us grow with you.